Cause related marketing is becoming more and more prominent in today’s society, where non-profit organisations are teaming up with profit organisations to support causes. Cause related marketing is the “joint funding and promotional strategy in which a firm’s sales are linked (and a percentage of the sales revenue is donated) to a charity or other public cause” (WebFinance 2015). It can be seen as an effective way for businesses to increase profits and brand reputation while also making a positive impact on the wider community. “Cause related marketing is a highly effective way to build the brand, to reinforce, demonstrate and bring life to corporate values and to make corporate social responsibility and corporate community investment visible” (Adkins 1999 p.4). But what is the consumers response to cause related marketing, and does it really improve sales and brand reputation? Many studies have been conducted over the years in order to gain insights and attitudes towards businesses that are involved in cause related marketing. One particular study aimed to reveal the effects of strategic and tactical cause-related marketing on brand loyalty. It was found that consumers have a significantly enhanced level of brand loyalty as a result of cause related marketing as long as the firm had a long-term commitment to the campaign and the campaign is related to a low involvement product. (Van Den Brink, Odekerken-Schroder & Pauwels 2006, p.15). Another study was conducted in order to understand the influence of cause related marketing on consumer choice. The study indicated that information regarding a business’s support of social causes can affect the choice to purchase products (Barone, Miyazaki & Taylor 2000, p. 248). 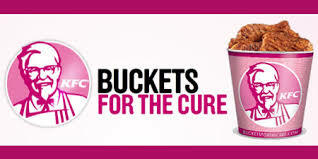 However, this study did find that the consumer’s choices is found to depend on the perceived motivation of the company’s cause related marketing campaigns. From the research I have conducted and the collection of articles, it is evident that cause related marketing is an effective way for businesses to improve their brand reputation, increase sales and also support a cause. However, it is so important for these for-profit businesses to ensure they complete sufficient research and choose to support causes that they feel strongly about. If consumers feel that businesses are only running cause related marketing campaigns to increase sales, consumers will be less likely to support their campaign. Adkins, S 1999, Cause related marketing who cares wins, Reed Educational and and Professional Publishing Ltd, Woburn, MA. Barone, MJ, Miyazaki, AD & Taylor, K 2000, ‘The influence of cause-related marketing on consumer choice: Does one good turn deserve another?’, Journal of the Academy of Marketing Science, vol. 28, no. 2, pp.248-262. Van Den Brink, D, Odekerken-Schroder, G & Pauwels, P 2006, ‘The effect of strategic and tactical cause‐related marketing on consumers’ brand loyalty’, Journal of Consumer Marketing, vol. 23, no.1, pp.15-25. Have you ever thought why those Cadbury Chocolate bars are placed just as you head to the register at a supermarket? Are they placed there purposefully for consumers to notice and buy? Marketers for brands spend much time and money on the layout of stores in order to gain the consumer’s attention for purchase. In fact, individuals are making around 2/3 of their decisions in-store (Mktg Science 2013). This means there is a good opportunity for marketers to influence consumers’ decision making by strategically placing their products in stores. Chandon et al. 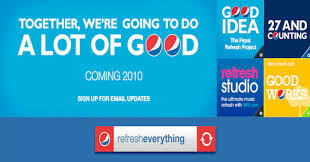 (2009) in their article explored the number and position of shelf facings on brand attention and evaluation at the point of purchase. They found that top-shelf and middle-shelf positions gained more attention than low-shelf positions (Chandon et al, 2009, p. 1). From this it is evident that most marketers are looking to position their products at eye-level or just above. This little change of position on a shelf could potentially increase or decrease sales. We can see from this research that many consumer purchases are not a result of extensive pre-planning, but impulsive, unplanned purchases. The passive model for decision making reflects these ideas, where the consumer is seen as submissive to the promotional efforts of the marketer (Schiffman et al. 2014, p.489). Consumers in this model are perceived to make impulsive, irrational purchases, which is what happens when a consumer makes an in-store, point-of-purchase decision. A study conducted by Hamilton and Chakravarti aimed to gain some insight into customer’s point-of-purchase decision making. What they found is that when coupons were used, there was a lower probability of unplanned purchases. “However, items that were on display, items with longer inter-purchase cycles, and hedonic categories were associated with greater in-store decision making” (Hamilton & Chakravarti, 2008, p.52). It was also discovered that females tend to make more unplanned purchases than males (I can see some logic in that), and as household size increased, so did the chances of making unplanned purchases. 3. Reduce browsing. Visiting all aisles in a supermarket increases your exposure to stimuli. 4. Reduce the amount of time spent in the store. 5. Have cash ready and pay by cash. If you are prone to impulsive shopping use this as your bible! Chandon, P, Hutchinson, JW, Bradlow, ET & Young, SH 2009, ‘Does In-Store Marketing Work? Effects of the Number and Position of Shelf Facings on Brand Attention and Evaluation at the Point of Purchase’. Journal of Marketing, vol. 73, No. 6, pp. 1-17. Hamilton, R & Chakravarti, D 2008, ‘New Insights in Consumer Point-of-Purchase Decision Making’, Advances in Consumer Research,vol. 35, pp. 52-54. Schiffman, L, O’Cass, A, Paladino, A & Carlson, J 2014, Consumer Behaviour, 6th edn, Pearson Australia Group Pty Ltd, Frenchs Forest, NSW. I was given the simple (or what I thought was simple) task of going to the supermarket for my Mum to get some cereal for our family. I haven’t gone grocery shopping for a long long time and was given, what I think, a pretty easy task. As I entered the cereal aisle I was bombarded with 1000000 different types of cereal, but not only were there so many to choose from, they all looked exactly the same bar some minuscule changes. 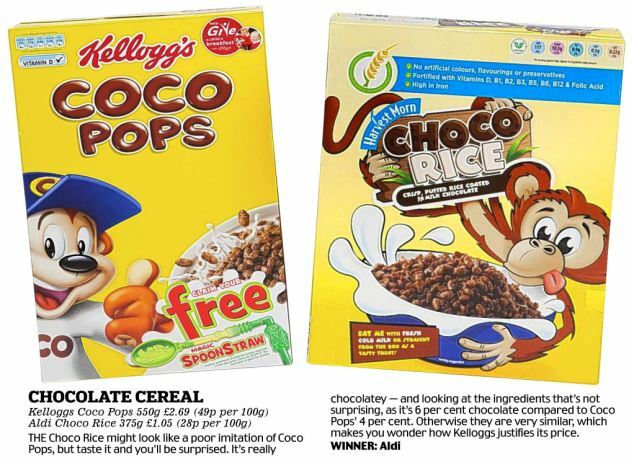 I panicked, and bought what I thought was coco-pops. 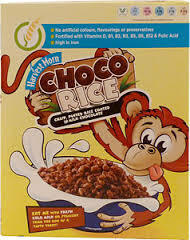 But once I got home I realised it was in fact Choco Rice. What I experienced that day is the term Stimulus generalisation. “The inability to perceive differences between slightly dissimilar stimuli”(Schiffman et al. 2014,p.690). The idea of stimulus generalisation comes from the theories of Classical Conditioning. 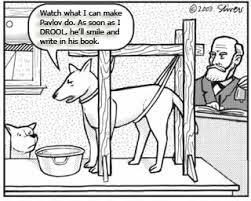 Pavlov, in the early twentieth century found that when ringing a bell and then giving dogs food, they would salivate. It was then found that when the bell rung however followed with no food, the dog would still salivate (EruptingMind 2014). These theories indicate that individuals can make the same response to slightly different stimuli. These imitative, ‘me-too’ brands often are deliberately placed right next to premium brands on the shelf. Consumers can easily be confused (like me) by this, and also by brand names and logos sharing strong similarities. 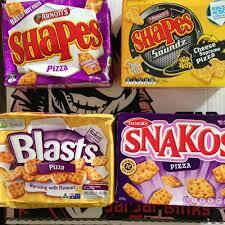 A great example of stimulus generalisation is the packaging of foods found in the supermarket Aldi. For those of you that have been in Aldi supermarkets before would know exactly what I’m talking about. 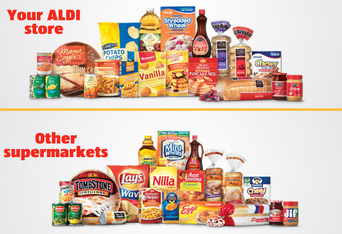 Many packaging designs in Aldi resemble premium brands such as Arnott’s Shapes, Smith’s Chips and Nutella. Well for the marketers of the imitative or “me-too” products, this is a win-win situation. These brands are normally sold at a lower cost than premium brands, there are little marketing costs involved, and they are able to sell large quantities due to the perceived similarity of those premium brands with a good reputation. Some premium brands loose millions of lost sales due to stimulus generalisation (Schiffman, 2014,p. 205). Marketers of premium offerings will often trademark their brands in order to try and avoid this. Marketers of leading brands will also try to persuade their market to discriminate against stimuli. “the ability to select a specific stimulus from among similar stimuli because of perceived differences”(Schiffman et al. 2014,p.690). 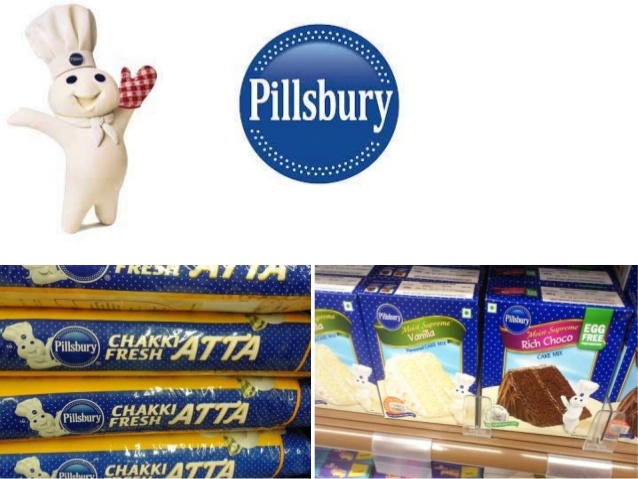 A great example of a brand’s packaging that has established a unique image is Pillsbury. There packaging contains blue and white polka dots, with the Pillsbury ‘dough boy’ as well. 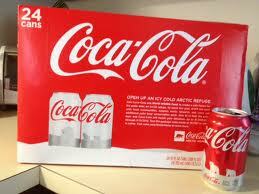 Consumers would be able to effectively discriminate this brand from others in the market (teenasai 2013). 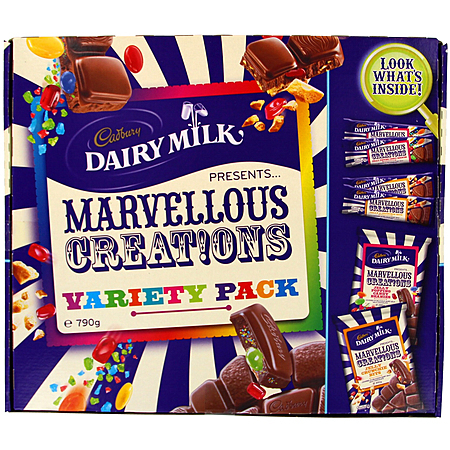 Stimulus Generalisation is also applied with premium brands where marketers will extend product lines and categories. As much as 80% of new products that are introduced into the market each year are product or brand extensions (Schiffman et al. 2014, p.205). These new products are a lot cheaper to bring into the market when associated with established, valued and trusted brands. This idea was studied in the article ‘Consumer evaluation of brand extension: Pakistani Context’, where the authors found that positive consumer evaluation would be present if brand extensions had an already established strong reputation in the market (Soomro et al. 2013 p. 3643). Soomro, YA, Sana, H, Irfan, SR 2013, ‘Consumer Evaluation of brand extension: Pakistani Context’, African Journal of Business Management, vol. 7, no. 35, pp. 3643-3655.
teenasai 2013, Consumer Behaviour – Stimulus Generalisation vs. Stimulus Discrimination, Consumer Behaviour, weblog post, 16 October, viewed 14 May 2015, <http://www.slideshare.net/teenasai/consumer-behaviour-stimulus-generalisation-vs-stimulus-discrimination&gt;. Theories of Learning in Psychology 2014, EruptingMind, viewed 14 May 2015, <http://www.eruptingmind.com/theories-of-learning-in-psychology/&gt;. For those who know me, I am extremely indecisive. I can’t decide what clothes to wear or what food to eat without someone helping me out. So when I finally came to a decision that I wanted to get new furniture for my room, I brought my mentor (my Mum) with me to look around. I was very unsure as to what I was looking for, I was even undecided as to what furniture I needed in order to change my room around. We walked aimlessly around IKEA for what seemed like 12 hours, for me to then realise I wanted wooden style furniture. We were on our last legs, we were tired, we were shopped out, and I was beginning to get more and more frustrated as each of the 10 000 shops we went in kinnddaa had what I was looking for but I wasn’t entirely happy. Our last shop, a little store called Number 66, was my saviour. This store from the outside was nothing spectacular, but the pieces inside were amazing. Not only was the furniture great quality, but the man who sold me my furniture was the most helpful worker I have ever encountered. I walked in looking for a dressing table and walked happily out with not only a dressing table, but 2 bedside tables anndddd a bed!! Patience, knowledge and variety were the three key elements that led me to my purchase. He was open and willing to work around my needs in order to ensure I walked out with a smile on my face. I was able to custom make my furniture and my bed head and his services continued after I had purchased my furniture. From this experience I will honestly look no further than his store. I have since recommended many friends and family to his store because of amazing customer service I experienced when shopping at lucky Number 66! As I just started getting comfortable with writing and WordPress, the end of semester has crept up on me and surprised me. I have thoroughly enjoyed each week studying BCM 112 at Wollongong University, learning and discussing convergent media practices. As week four presented the great debate of the Iphone or Android, I enjoyed writing my 4th blogpost for this course: First world problems. In that week, I discussed how my own home does not worship the Android what so ever, and that I have been brought up in a world filled with Apple. Not that I am complaining one bit about that, but the reason I enjoyed this week so much is because I was able to research and understand why there is a debate on whether the Iphone or Android is most suited to certain individuals. I was able to completely comprehend the notion of a locked device, compared to a generative platform. And while I have used Apple devices nearly all of my life, I had no clue that Apple was a “locked device”, meaning the makers of the Iphone have complete control of the operating system. As I am a teenager and born in Gen Y, I love technology and anything to do with phones, so this week was also a favourite in terms of learning about new products and services that are available to us. Concluding this week’s topic, I actually made a very brave decision and bought myself a Samsung Galaxy S111 due to the information I learned from this topic. A few weeks went by, and while I loved most topics that were being discussed each week, the next topic that really caught my eye was transmedia narratives. In this week I was able to recall my love for Harry Potter and it’s own transmedia narrative. While researching the world of Harry Potter, the amount of content and materials produced to support the books and movies of Harry Potter was astonishing. I was able to recall on my own experiences of purchasing the Bertie Botts every flavour beans one year at Christmas time, and this was a big thing! I distinctively remember being so excited that I was eating the same thing that Harry Potter was eating. This week really caught my eye and had my complete attention, mainly due to the fact that I felt I was participating in Harry Potter’s transmedia narrative, so I could really relate to this weeks topic. The next weeks followed with topics about the remixing and burning culture and the idea of clicktivism and slacktivism, but another subject that really had me still awake at 2am online was identity and difference online. I feel like I really connected and enjoyed this week’s topic as I have had first hand experience of trolling and effects it has on individuals. There have been multiple incidents on Facebook where I have been upset and angry at those I called my “friends”, tormenting me and annoying me because they were bored and felt it was funny to do so. This week i defined the word trolling, an act of annoying or frustrating someone online, and also explored monogyny and the effects it has on individuals. Many individuals find it funny to write discriminating statuses about women, and at the start I didn’t care much for those who did it. But after studying this week’s topic and researching different incidents of cyber bullying towards women, I have developed an opinion on this matter. 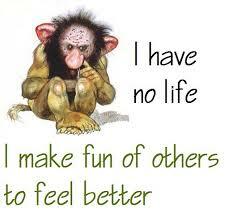 I find it absolutely shocking and unnecessary for those to ridicule others on social media sites. 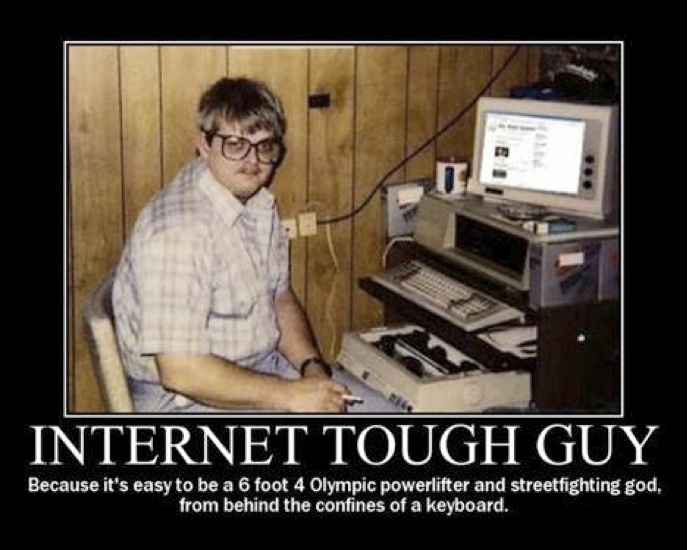 This week has really opened my eyes to the dangers of online identities, and I now know to ignore those individuals who think it’s funny to hurt others feelings when they are behind a computer screen. I have developed many skills in writing I thought I’d master while studying BCM112. I have enjoyed every minute, researching new technology and media platforms and joining the world of blog posting and Twitter. And although it is goodbye for now, I’m sure I’ll be back on here in no time, voicing my opinions on topics that are right up my alley. Thank you. I only thought trolls were a mystical character, hiding under bridges waiting for those to cross. 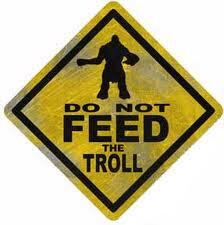 But trolling is actually an Internet slang, describing the act of behaving in a way that annoys, angers or frustrates somebody intentionally. And although it sounds not so serious… it is. As the idea of citizen journalists has become more popular, individuals are posting their opinions on social media sites such as Facebook and Twitter. But as people are posting their opinions on topics such as political views, others are feeling inclined to comment on these posts, humiliating and completely offending others for a laugh. Although many find these kinds of behaviours amusing and just for a laugh, it is still a form of bullying, and can really hurt those who are victims of this behaviour. Another act of bullying online is the art of misogyny. I for one have never come across this word before, and when I took the time to research the meaning, I was completely taken aback at the countless forms of attacks towards women. Misogyny is a hatred and dislike towards women. It highlights the derogatory words and phrases that are used to describe women. 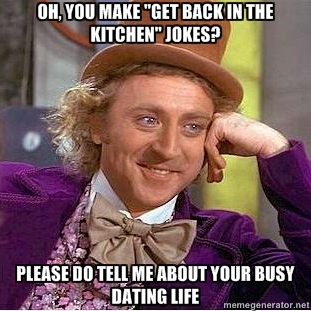 A perfect example of sexual discrimination of women on the internet was the phenomena of “get back in the kitchen” phrases. As a Facebook user, I was constantly bombarded with statues after statuses of men making jokes about women in the kitchen. At the time, I found it quite funny, but as I now know about the behaviour of misogyny, I find it so rude and condescending. It highlights the idea that women don’t belong in the workforce and the only real place for them in society, is to cater for men and their husbands. This article discusses Facebook as a site for misogyny – even advertisements on the side of pages conduct discriminatory behaviour towards women. 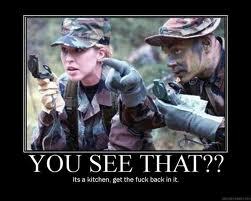 And this is what I think when men make these jokes.. Us gen Y individuals are constantly being stereotyped as lazy, unemployed, too dependent on our parents and politically unaware. And although I do not believe all things said about us, I do wonder why I still, at 19 years of age, feel politically uneducated and unaware. Is it that I am too caught up in my own life to care about politics, or is it that political speeches made by those in power really have nothing to do with us at all? As technology and the popularity of social media websites is increasing, political campaigns are beginning to take shape on Facebook and Twitter, reaching out to the fellow Gen Y individuals. This is the age of ‘Clicktivism’. It is about using social media sites to bring about changes in the world, and I for one, am on board with this concept. However, in order to perform effective political activism on social media websites, we as individuals need to avoid slacktivism, to ensure our voice is actually being heard. Slacktivism describes individuals believing they are involved in politics because they have clicked or ‘liked’ a page. Their ‘particpation’ is easily achieved, but no proper action or contribution is actually made. The concept of slactivism is loosely connected to youth and politics today. Many believe that Gen Y individuals are only contributing to this concept, therefore, leading to no action for campaigns. Henry Jenkins states that social media has the power to change the world, and I completely agree with him. However, are we as individuals doing all we can on social media sites to change the world? An example that defiantly reached my Facebook news feed was Kony 2012. At first, I had no knowledge of this campaign and what was asked of me. This campaign at best, described the notion of clicktivism, basically clicking the ‘like’ button to support a political movement. The idea was perfect and it hit Facebook users by storm. But the problem with this campaign is that even though we have social media sites to express political movements, we as individuals need to do more than just click ‘like’ to actually make a difference. We needed to move forward from the concept of slacktivism, and contribute more to this campaign. Clickivism is just the start of effective political campaigning We need to also ensure an element of traditional political activism is used to express our voices and opinions. 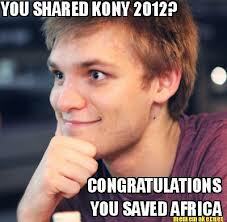 This blogpost provides a insight into Kony 2012 and the notion of clicktivism and slacktivism. Put that on Youtube and remix it! We are the people that rule the world! Yes, this is a song title by Empire of the Sun but no, I will not be talking about how this song is extremely catchy and is great to dance to (however this song may be remixed which would be perfect for my topic). I am referring to my blog post a few weeks back where I discussed new technology and media platforms allowing us to be heard. I am talking about the shift from us (the audience) being passive consumers, to now active participants who share, consume and now produce products. We are finding new and exciting ways to create content and even remix and mash content! At first, I thought remixing only meant using that song Satisfaction by Benny Benassi, and getting a DJ to mix in another tune to make a new song. A remix is known to be something that you have heard or seen before, but changed into something different.But on the topic of convergent media practices, we are not just talking about the art of remixing a song, but more the phenomenon and new culture of remixing. 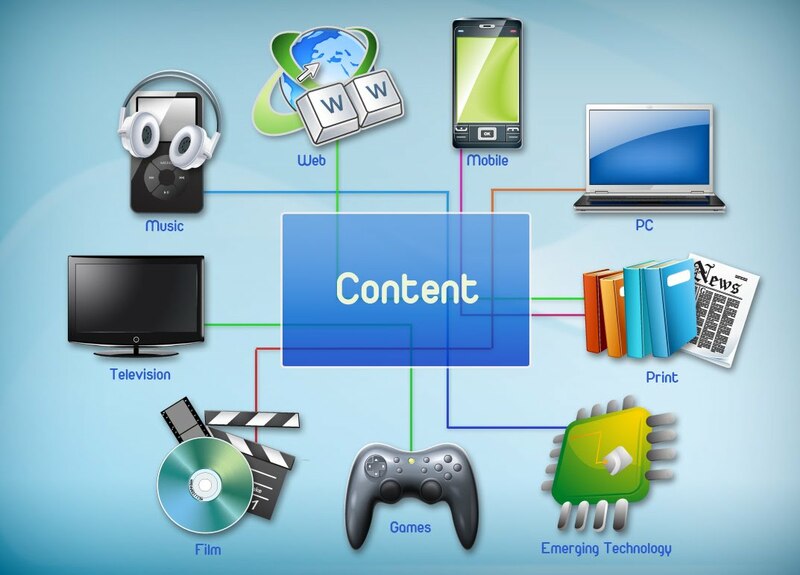 This new culture highlights the convergence of media platforms and the shift from old technology, to now media platforms that allow us to use a part of old material to create new content. In our current world, remixes are most popular, highlighting current political issues, attending to individuals interests, or even just for a laugh. This is a standard example of a mahup. ‘Satisfaction’ – Benny Benassi, is being mixed with another song, ‘In Da Club’ – 50 cent, to create a new beat and song in itself. Another classic example of an extremely popular film series that uses content from other movies and creates a whole new movie is ‘Scary Movie’. These movies are based on numerous horror films, added with humour, to create new content. It uses content from movies such as Scream, The Ring and Saw. In the latest Scream movie, the producers use material from the popular ‘Paranormal Activity’ movie series and ‘ Black Swan’to create a humour filled, mashup movie. There is no stopping this new culture of remixing. It allows the former passive audiences to now take control and produce, share and consume content. Although there are many issues with copyright do you really think it can stop the thousands of individuals using old material and making something new of it? The days of seeking news and information from newspapers and journalists seem to be fading away and the idea of the audience now being prosumers seem to take over. Instead of our old passive consuming ways, we are all now taking action and voicing our views on what is going on in the world. We have moved into a new phase media participation known as citizen journalism. The rise of new media platforms has encouraged audiences to state an opinion on the news of today. Starting with the traditional media of Gutenburg’s press, as new emerging technologies develop, we move away from traditional media and focus on the new faster approach. Let’s face it, when a crisis happens in the world, say on a Monday night, traditional media would not have reported this issue until the next day. With the emerging technologies of today, such as Twitter and Facebook, audiences are now able to take on the role as prosumers and citizen journalists, and report and share there opinion straight after the event has occurred. An example of this shift in media participation is highlighted in the story of the earthquake and Twitter. It is reported that postings of the earthquake on Twitter were faster than the actual seismic waves. How crazy is that? These social media sites have allowed audiences to share the news and their opinions faster than any other source. “Most citizen journalism strikes me as nothing to do with journalism at all. A lot of bloggers seem to be socially inadequate, pimpled, single, slightly seedy, bald… young men sitting in their mother’s basements and ranting. They are very angry people… (citizen journalism) is the spewings and rantings of very drunk people late at night”. This quote questions the credibility of citizen journalists and highlights the difference between professional, degree holding journalists and young men and women sitting behind a computer screen voicing their angry opinions. 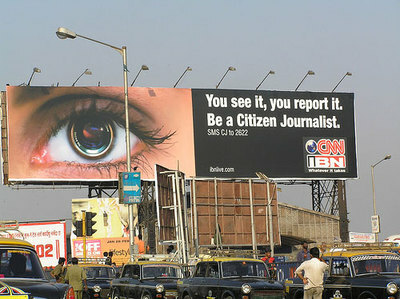 In my opinion, I believe citizen journalists and professional journalists are very different. I would much prefer to read and believe a credible source from a newspaper rather than someone’s Facebook and Twitter page. I quite enjoy reading others opinions and am guilty of jumping on Facebook late at night and voicing my angry opinion, but I still do not believe citizen journalists are a threat to those who put in their time studying hard to bring us stories we love to read. I would love to hear anyone’s opinion as this topic had me scratching my head at 2:00am in the morning. Have you ever had that feeling where you are apart of a movie, a tv show, a game.. anything? That feeling where you are so into it that if a character dies, a part of you dies as well? Transmedia has completely taken over the idea of multimedia storytelling and they are very different. Multimedia is about telling a single story over multiple mediums, while on the other hand, transmedia storytelling involves telling multiple stories over multiple mediums that fit together to tell one big persuasive story. We start with a simple multimedia story of film and then sequel. I distinctively remember when I was younger I bought the Harry Potter PC game. The game followed a specific storyline, simular to the first Harry Potter movie but not the same, and you were able to make your own path depending on what you enjoyed. This game was not the exact same storyline to the first movie, but because it was telling a simular story to the first movie, over a different medium, it all came together to make one big persuasive story. Another memory of childhood and the transmedia storytelling of Harry Potter were the ‘Bertie Bott’s Every Flavour Beans’. These beans were in the movie and books, and to bring them out into real life for the audience to eat, really gave a sense of engagement. I remember trying all the different flavours (some yummy and some disturbing) and being so excited that I ate what Harry Potter ate in the movie. That form of storytelling I believe really gave a sense of participation and was very effective in terms of transmedia storytelling. As we can see with these examples, the main key to transmedia storytelling is ENGAGEMENT. The more points of entry to a story means the more options for the audience to engage in the content. It allows those who enjoy reading to get stuck into the books, those who are gaming legends can play until their hearts desire, and people like me who need to see to believe, enjoy the movies. The Harry Potter experience has successfully produced a transmedia storytelling experience which has allowed audiences to view many stories of many different mediums to form one big, persuasive magical story. 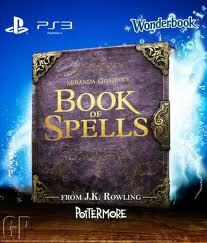 This game allows people to create and practice spells and potions.